Phonathon callers are ambassadors for Illinois Tech bridging the gap between the institution and alumni from across the county. Our callers earn money while engaging alumni in order to keep them connected to Illinois Tech. Phonathon students go through a highly selective application process and represent many different areas of the university. Most importantly our callers are raising money for Illinois Tech. Our students talk to thousands of alumni and raise between $70,000–$100,000 every year, much of which goes toward scholarships to directly benefit our students. 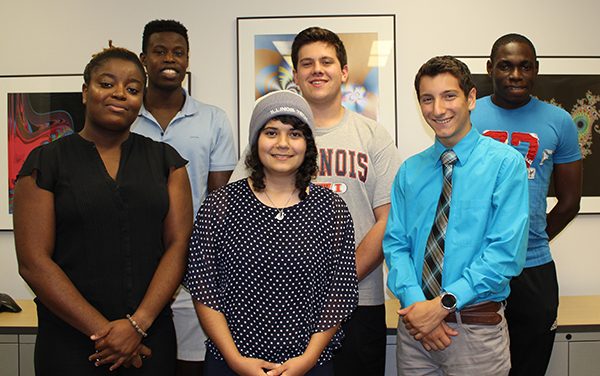 Our callers not only make a huge impact for Illinois Tech, but they also get a head start at their own careers by gaining key communication, persuasion, organization, and leadership skills as a part of our team. Students—are you looking for a job where you can make a difference for Illinois Tech? Contact Joey Carrillo, assistant director of annual giving - student and young alumni programs, at jcarri10@iit.edu for more information about how you can join the Phonathon team. Learn a little bit about the students who will be calling you! There are many ways to give to Illinois Tech and fulfill your Phonathon pledge. Read about how your donations, large or small, are having an impact on our university.